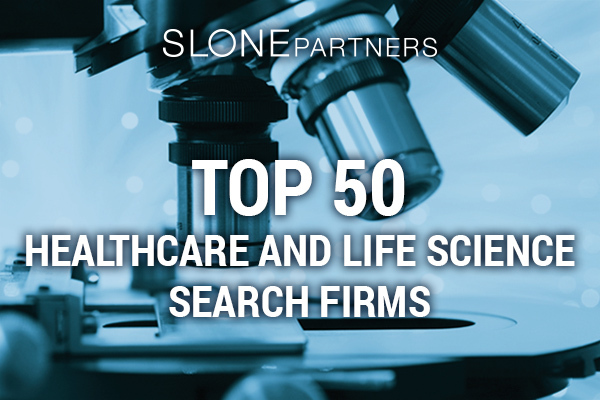 Premier executive recruitment firm, Slone Partners, is proud to have been named a Top 50 Healthcare & Life Science Search Firm by Hunt Scanlon Media. Hunt Scanlon Media is one of the most respected life science publications in the United States and the most widely referenced global news source in the human capital sector. “It is a great honor for Slone Partners to be part of this distinguished list of leading executive life science search firms. Hunt Scanlon is the media reference when it comes to all that is happening in the market, and to be selected by them alongside the biggest industry players is a privilege. It is proof that our continued efforts to deliver the highest quality of service have been recognized,” said Leslie Loveless, CEO of Slone Partners. “At Slone Partners, we are constantly innovating to stay at the leading edge of recruitment practices. We do not simply place leaders; we continuously refine our search processes to attract and secure the best talent for the organizations we serve. We focus on finding the perfect fit for each position that we fill ensuring the long-term success of our clients and their new hires,” stated Adam Slone, Founder of Slone Partners. Slone Partners’ strategic approach to finding and securing the best leaders for their clients is unique in the industry. A thorough knowledge and understanding of the market place and the ability to truly assess their clients’ cultural environment allows Slone Partners to build strong, diverse teams. The full list of nominees is available in the Healthcare and Life Sciences Recruiting Special Issue of Hunt Scanlon Media’s Executive Search Review (ESR) publication. Founded in 2000, Slone Partners is a premier executive search firm that specializes in recruitment for the diagnostics, life sciences, clinical trials, contract research, healthcare information technology and laboratory testing industries with offices in Boston, Washington, D.C. and San Francisco.